Campus Interview of our New and fully automated “Quartz Slab Plant” TAANJ “Natural Stones and Quartz from the house of Pacific Industries Ltd.
GITS is organizing the Pool Campus Drive of Adani Gas Ltd. for B. 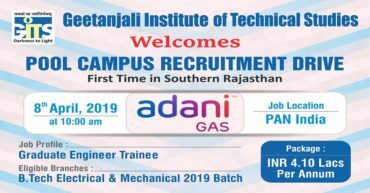 Tech Mechanical & Electrical Students (2019 Batch) . 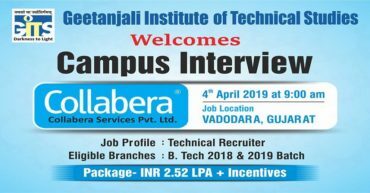 Campus Drive of Collabera Service Pvt. Ltd. for B. Tech 2018 & 2019 Batch Students. 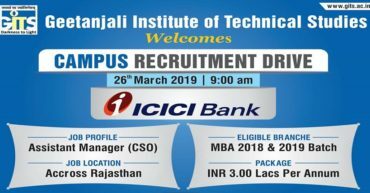 GITS is going to organize the Campus Interview of ICICI Bank Ltd. for MBA 2018 & 2019 Batch. 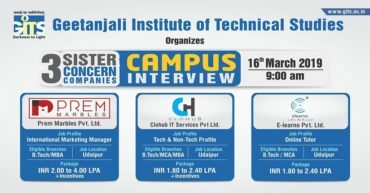 GITS is organizing the Pool Campus Interview of Gateway Group of Companies for B.Tech CSE & MCA Students. 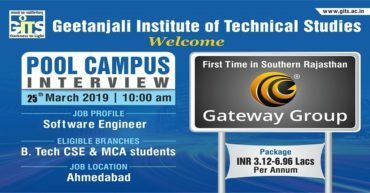 CAMPUS INTERVIEW OF CLOHUB IT SERVICES PVT. LTD./ E-LEARNO PVT. LTD./ PREM MARBLES PVT. 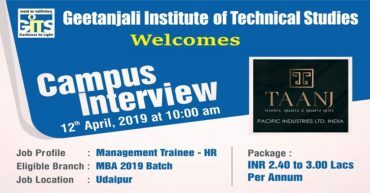 LTD.
Campus Interview of 3 Sister Concern Companies for our B. Tech/ MBA/MCA 2019 Batch. GITS is organizing the Campus Interview of Thermax Ltd. for the GITS B.Tech Mechanical& Electrical Students. 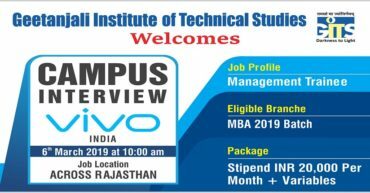 Campus Interview of Vivo India for MBA 2019 Batch for the Profile of Management Trainee. 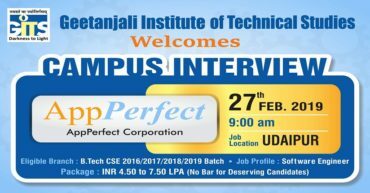 Campus Interview of App Perfect Corporation for B.Tech (CSE) 2016/2017/2018/2019 Batch students for Software Engineer. 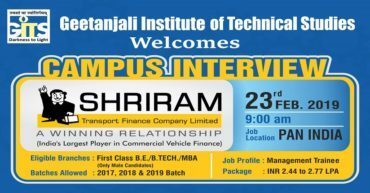 Pool Campus Interview of Shriram Transport Finance Company Ltd For B.Tech. / MBA Students of Udaipur Region.